If you're saving up your pennies for the post-Halloween candy sales, you'll be glad to know that there's cheap coffee on the horizon. And by horizon, we mean today. Starbucks is running a special "Happy Hour" deal on Friday and you can score a free espresso drink. 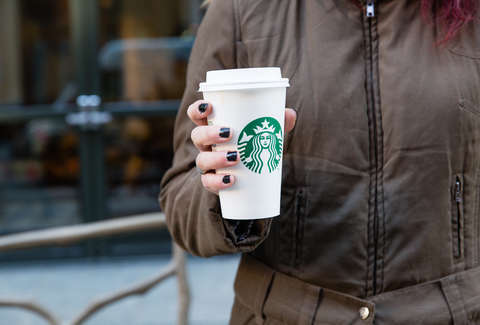 On October 19, Starbucks has a buy-one-get-one (BOGO) deal on all espresso drinks, size grande or larger, a spokesperson for the company confirmed. You can get your hands on the bonus coffee from 3pm until close (local time) at most of the coffee mega-chain's locations across the United States. While you probably think of Mochas and Pumpkin Spice Lattes when it comes to espresso drinks, the deal also includes iced versions of espresso drinks -- Vanilla Lattes, Iced Americanos, Iced Caramel Macchiatos, among others. However, it doesn't apply to blended Frappuccino drinks, hot brewed coffee, and iced coffee. Maybe Starbucks has finally accepted that warm weather isn't coming back for far too long. Here's how you get in on the BOGO deal: If you're a Starbucks Rewards member, you'll get a barcode in your email and/or mobile app. Show that barcode to the cashier, and you've got a gratis espresso drink headed your way. Boom, extra caffeine for free. Otherwise, you can head to the Starbucks Happy Hour site to RSVP and get your code that way. If you do that, you'll be added to the mailing list to get future "Happy Hour" promotions, which is a good or bad thing depending on your willingness to have another email between you and inbox zero. Just remember that if you aren't sure, it's worth giving your local Starbucks a call to make sure they're participating in the whole "Happy Hour" thing. Then tell a coworker that their afternoon coffee is on you, but if you forget to mention that you didn't have to pay for it, no big deal.